Spring starts the orange tree show, with white fragrant blossoms frothing over the canopy and scenting the entire garden. Act two brings the tiny green fruits that dot the tree's branches. Over time, they get larger and rounder, and turn a shade of orange gold. It's impossible to say how long you will have to wait to taste the sweet, ripe citrus fruit. It depends on the type of oranges in your home orchard, the weather and your own preferences. As a backyard gardener, you have the luxury of harvesting your oranges one by one as they become ripe. The best way to determine ripeness is a taste test. Shakespeare's King Lear declares that ripeness is all, and though he wasn't discussing oranges, he might have been. When you ask when to pick oranges from your orange tree, the simple answer is "When they are ripe." Ripe oranges are fragrant, flavorful and sweet. Immature oranges are bitter or insipid. Remember that oranges ripen on the tree or not at all. Once you pick them, they will not get any sweeter than they are at that moment. But don't think you have to get them off the tree the moment they ripen. Ripe oranges hold well on the tree for several weeks or more. Get them all off the tree before a major freeze, however. Don't start pulling off oranges and tossing them into baskets when you see the fruit turn a rich, deep shade of orange. While it's true that these citrus fruits grow in green and slowly ripen into deep orange, vivid hues are no guarantee that the fruit is ripe or sweet. The fact is, oranges change color when temperatures drop. As the peel turns orange, the fruit looks ripe, but it may be simply a reflection of the chillier weather that starts the process of removing chlorophyll from the fruit's exterior. On the other hand, green oranges are likely immature, although some varieties, like satsumas, can be ripe yet still show a little green. But while most ripe oranges will be a deep rich color, not all fruit that is a deep, ripe color will be ripe. Oranges take between six and eight months to ripen. That means that many of them traditionally ripen in December. A few different types, including Valencia oranges and blood oranges, generally ripen later. But you aren't going to be able to use a calendar to figure out when to pick your oranges. The ultimate arbiter of orange ripeness is taste. The best, and some would say only, way to determine when you should pick an orange is to try one. Pick it from the tree. Peel it. Taste it. If it brims with sweetness, that orange is ripe, and some of its compatriots may be ripe as well. Harvest the fruits by clipping them off with pruning shears, especially if the oranges are thin skinned. For tougher fruit, you can grasp a fruit, twist it and tug. Refrigerate what you aren't going to use. They will last a couple of weeks. 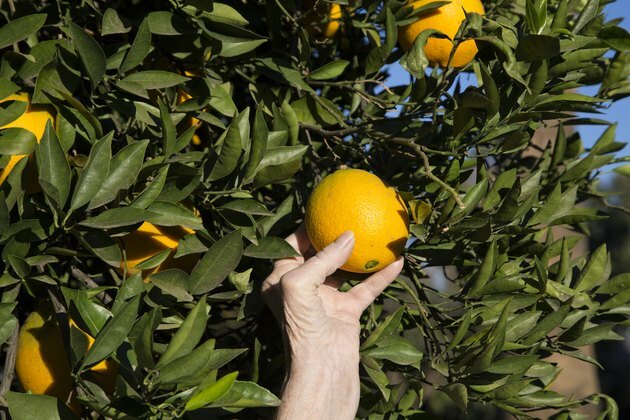 When Is the Florida Orange Harvest?